Arrowwood National Wildlife Refuge and Birding Drives Dakota joined together under the alliance of Friends of Arrowwood NWR. This union was established February 18, 2011. The USFWS has 6 Priority Public Uses: Hunting, Fishing, Wildlife Observation, Wildlife Photography, Environmental Education and Interpretation. 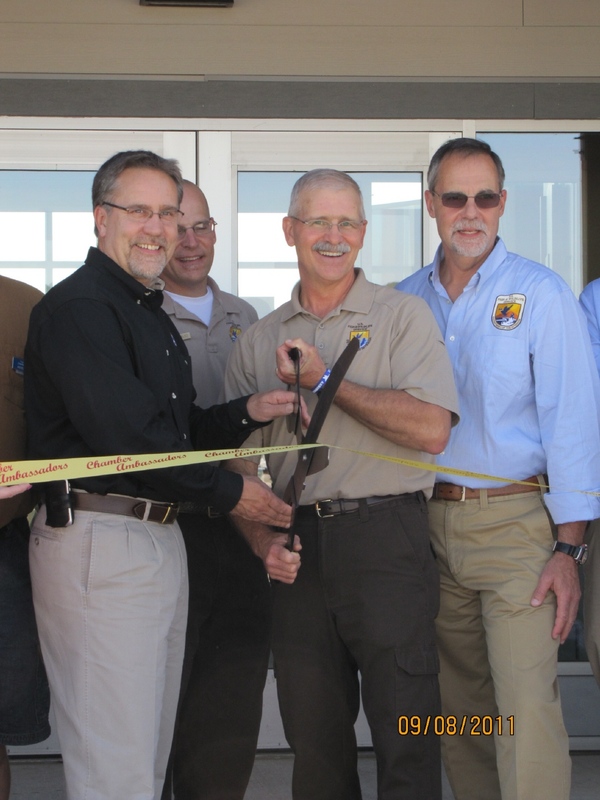 September 8, 2011: Grand Opening and Dedication of the new Arrowwood National Wildlife Refuge Office and Vistor's Center. 180 guests joined together to view the new buildings and were served lunch cooked by the Davenport Lions. Davenport Lions cooking the meal. Steaks cooked on a pitchfork, sausages, and fresh-made chips. Guests mingling in the shop. Kim Hanson, Project Leader, introducing guest speakers. Honker the Blue Goose, mascot of NWR, and Larry Longspur, mascot of BDD. Checking each other out with the new binoculars at Arrowwood NWR. of the Carrington Chamber of Commerce, and a guest. with his family: Zachary, Diane and Benjamin.